Palm Springs has a long history of being the vacation destination of Hollywood's stars, and no neighborhood was more popular amongst the famous than Old Las Palmas. From old-world beauties like Elizabeth Taylor and Katherine Hepburn to modern icons like Leonardo DiCaprio and Goldie Hawn, the community has a track record of catering to the affluent homeowners of the city. Properties in this desirable community are located on the north end of the downtown retail corridor, and sell for well over a million dollars. Old Las Palmas real estate is some of the most prestigious in the city of Palm Springs. Begin your search for Old Las Palmas luxury homes for sale below, or discover more about this community's close proximity to the vibrancy of the downtown core. Register for this site to explore Old Las Palmas homes for sale inside and out. As a member, you'll unlock advanced search tools, view additional home photos, and be able to save listings and searches. What initially began as a citrus grove where lemon and orange trees towered is now Palm Springs' premier luxury neighborhood. Developed in the 1920s, each luxury estate boasts its own unique style. Some homes embody the classic Palm Springs mid-century modern aesthetic. These feature banks of floor-to-ceiling windows, spotless white exteriors, and stylish grayscale interiors. Others bring a taste of the desert home with them. Adobe walls, stone floors, rough-hewn wooden beams, and landscaped lots peppered with cacti and desert flora make these homes a natural offshoot of the beauty that surrounds them. Others still adopt a Spanish building style with decadent tile work, corrugated red roofs, and spacious interiors. Despite their differences, Old Las Palmas real estate may be the most beautiful in the city. The yards that belong to these luxury manors have all the seclusion of a rural property with all of the convenience of being steps from the downtown. Private pools and tennis courts mean you can enjoy the mild climate on your own terms. If you love to swim, barbecue, or entertain guests, these homes will offer you everything you need and more. 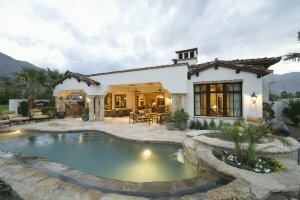 When you're lounging by the pool in your backyard admiring the vines and flowers that climb the privacy wall that wraps around your property, it's easy to feel like Old Las Palmas homes are miles from the rest of the world. Yet, many Old Las Palmas homes for sale are mere steps from the downtown district along Palm Canyon Drive. Shopping in downtown Palm Springs is an experience unlike any other. You'll find everything from antiques, to chocolates, to designer clothes, to art available for purchase. Come evening, enjoy a night out at one of the city's many restaurants and bars. There's even the Spa Resort Casino for those who love the occasional game of poker and live entertainment. A mere half hour to the southeast, the neighboring city of Palm Desert has over one hundred golf courses, making it the highest concentration of golf courses in the world. To learn more about buying or selling Old Las Palmas real estate, connect with me. As an expert on local real estate trends and the nuances of the area, I can find the perfect Palm Springs home to suit your tastes and your lifestyle. Based on information from CARETS as of April 19th, 2019 at 5:46pm PDT. The information being provided by CARETS is for the visitor's personal, noncommercial use and may not be used for any purpose other than to identify prospective properties visitor may be interested in purchasing. The data contained herein is copyrighted by CARETS, CLAW, CRISNet MLS, i-Tech MLS, PSRMLS and/or VCRDS and is protected by all applicable copyright laws. Any dissemination of this information is in violation of copyright laws and is strictly prohibited. Any property information referenced on this website comes from the Internet Data Exchange (IDX) program of CRISNet MLS and/or CARETS. All data, including all measurements and calculations of area, is obtained from various sources and has not been, and will not be, verified by broker or MLS. All information should be independently reviewed and verified for accuracy. Properties may or may not be listed by the office/agent presenting the information.